Nashville, TN -- Critically-acclaimed bluegrass duo and newly announced Grand Ole Opry inductees, Dailey & Vincent, are back on RFD-TV with season one and season two of their variety series “The Dailey & Vincent Show.” After overwhelming success and back by popular demand, “The Dailey & Vincent Show” will return Jan. 20 and continue airing on Fridays at 7:30pm ET, throughout all of 2017. Click here for RFD-TV listings. Nashville, TN -- Throughout the years, countless incredible guests have appeared on Reno's Old Time Music, and undoubtedly, some of the best Bluegrass television performances have played out upon the stages of this longstanding TV show. From the Band of Ruhks (one of the most-popular shows from earlier this year), to another episode of "Front Porch Gospel" (a collection of the best Gospel performances), to two new episodes of the brand new series "Hats Off to Bluegrass" (a compilation of the best performances ever captured), co-hosted by Rhonda Vincent and Sierra Hull, November's lineup will harvest a collection of Bluegrass' best and the fans will reap the blessing! For more information on Reno's Old Time Music, please visit www.RonnieReno.com and click on the TV Show tab. Nashville, TN -- Music fans have more than just cooler weather to look forward to this Autumn. "Reno's Old Time Music" celebrates the past, present and future of Bluegrass and Old Time Music with a great September lineup, which includes Rhonda Vincent. Nashville, TN --"Reno's Old Time Music" sizzles this August with performances from GRAMMY-nominated Claire Lynch, living legends Del McCoury Band and the indomitable Lonesome River Band. Superstar singer/songwriter Larry Cordle will entertain us with stories and song, and we will take a walk down memory lane with an archival performance from Reno & Smiley. It’s one Hot Summer lineup you don’t want do miss! For more information on "Reno's Old Time Music," please visit www.RonnieReno.com and click on the TV Show tab. Award winning bluegrass music artists, Dailey & Vincent have announced their new TV series to be presented by Springer Mountain Farms. In their announcement, they said, "Words cannot describe the joy and humbleness we feel as we officially announce our first national TV Show, "The Dailey & Vincent Show." Sponsored by our friends at Springer Mountain Farms, we have been conceptualizing this show for years and it brings happy tears to our eyes now that our dreams have come true. Willis, VA -- Dollywood favorites and North Carolina natives, Mountain Faith, will take their music to a broader audience this weekend when they make an appearance on RFDTV's “Larry’s Country Diner.” The show has become a favorite for audiences nationwide who are craving comprehensive traditional country and bluegrass programming, offering viewers a wholesome, down-home, nationally-broadcasted variety show known for its spontaneity, impromptu dialogue and live-to-tape performances by the best country music artists of yesterday and today. Nashville, TN -- Due to popular demand, Gabriel Communications, is pleased to announce that it will re-air “Country’s Family Reunion: Simply Bluegrass” throughout the month of May on the RFD-TV network, as well as FamilyNet. 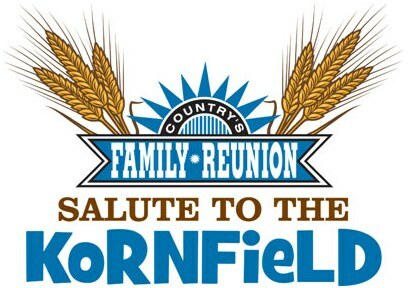 “Country’s Family Reunion,” the DVD/television series that brings America’s most-treasured artists together to reunite and reminisce assembled a cross-section of award-winning and legendary Bluegrass artists, from “finger-pickers,” to “purists,” to “New Grass” contemporaries. 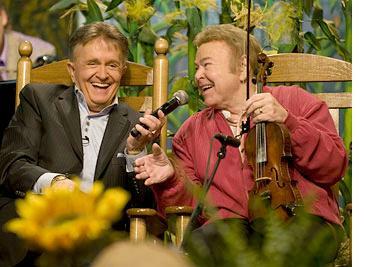 The series is hosted by Hall of Fame Inductee Bill Anderson and 14-time Grammy winner Ricky Skaggs, includes performances by Dailey & Vincent, The Whites, Del McCoury, Sam Bush, Rhonda Vincent, The Roys (Lee & Elaine), Jerry Douglas, Donna Ulisse, Mac Wiseman, Ramona Jones, Bobby Osborne, Dierks Bentley, Paul Brewster, Ronnie Reno, Doyle Lawson, Sierra Hull, Larry Cordle, Carl Jackson, The Gibson Brothers and Jesse McReynolds, backed by the genre’s foremost musicians Barry Bales (Bass), Bryan Sutton (Acoustic Guitar), Adam Steffey (Mandolin), Stuart Duncan (Fiddle) and Ron Stewart (Banjo). Donna Ulisse on RFD-TV's Simply Bluegrass this Weekend! Singer songwriter Donna Ulisse can be seen this weekend on RFD-TV's Country Family Reunion-Simply Bluegrass by tuning in on Friday, March 28 at 8:00 p.m. Eastern Time and Saturday morning March 29 at 6:00 a.m. Donna was honored to have been a part of the special which was taped in the fall of 2013 and was truly an all-star lineup of guests. Read more about Donna Ulisse on RFD-TV's Simply Bluegrass this Weekend! Nashville, TN -- Country’s Family Reunion (the DVD/Television series that brings America’s most-treasured artists together to reunite and reminisce) will premiere episodes of its latest offering “Country’s Family Reunion: Simply Bluegrass” beginning Friday, March 7 at 8 p.m. Eastern/7 p.m. Central on RFD-TV and FamilyNet. Hosted by Hall of Fame Inductee Bill Anderson and 14-time Grammy winner Ricky Skaggs, this reunion features a cross-section of award-winning and legendary Bluegrass artists, from “finger-pickers,” to “purists,” to “New-Grass” contemporaries. Nashville, TN -- “Larry’s Country Diner,” the down-home variety program that draws over 1.4 million loyal viewers each month as one of RFD-TV’s most popular shows, continues to feed the appetites of traditional country music lovers. Fans are in for a veritable feast of talent with the November lineup, which includes performances by Grammy award-winning B.J. Thomas (“Raindrops Keep Fallin’ on My Head”), award-winning Bluegrass siblings The Roys (Gypsy Runaway Train), original outlaw Jim Glaser ("Lovin' Her Was Easier than Anything I'll Ever Do Again"), long-standing Country Music star Tracy Lawrence (Find Out Who Your Friends Are), and three-time IBMA Entertainer of the Year Dailey & Vincent (Brothers of the Highway) with special guest, former tenor of the famed Statler Brothers and Hall of Fame inductee Jimmy Fortune (Elizabeth). Nashville, TN (August 7, 2013) - Award-winning brother/sister duo The Roys return to RFD-TV's popular Larry's Country Diner with songs from their latest steamin' hot CD, Gypsy Runaway Train, and more on August 10 and 11. The show, which draws over 1.4 million loyal viewers each month, airs Saturday nights at 10 PM CT / 11 PM ET and Sunday evenings at 6 PM CT / 7 PM ET. The siblings performed three songs from their current CD: The blazin' title track, "You Can Count On My Love" and "I Wonder Where You Are Tonight." They also sang the poignant "Grandpa's Barn," a fan favorite from their previous disc, New Day Dawning. Larry's Country Diner also airs on FamilyNet; check local listings for broadcast times in your area. Nashville, TN (September 14, 2012) Rural Rhythm Records is very proud to announce the premiere of Bluegrass Comes to the Valley on RFD-TV as part of Reno’s Old Time Music. Ronnie takes a trip up to the Valley with some great music and history of Renfro Valley, Kentucky. This two part show includes performances by bluegrass music artists Marty Raybon, Carrie Hassler, Audie Blaylock & Redline, Rodney Dillard & The Dillard Band, and the Darrell Webb Band. Nashville, TN (February 1, 2012) – Will the circle be unbroken? If "Country's Family Reunion" has anything to do with documenting the stories and songs of country music's legendary family, it will remain firmly and enjoyably intact. Since 1997, Gabriel Communications has been bringing artists together into one room to reunite and reminisce about their careers, perform signature songs and share stories while the cameras roll. The result has been pure magic, leading to popular TV airings and successful DVD sales leaving country fans clamoring for more.